There are truck wash business owners and there are truck wash business owners. But what makes Joe Gonzalez, DetailXPerts North Los Angeles’ owner-operator, a cut above the rest? Why should you entrust him with your prized possession? Meet Joe Gonzalez in person and you’ll immediately feel his warm and welcoming demeanor. After all, this Hispanic who does not know how to speak Spanish has been in the retail business for over thirty years. A master salesman, indeed! But make no mistake - because there's more to this sales executive than the gift of gab. Beyond his precise, thorough, and analytical behavior lies an innate love for the environment and a big heart that's always ready to help others. This is why he chose to be a DetailXPerts franchisee. Aside from providing efficient, reliable car and truck washing services, he knows that through his truck wash business, he can help Los Angeles save a lot of water and prevent water pollution. With the effects of the five-year drought lingering in the air, such acts truly align with the city's efforts to protect and conserve water. He is also aware that his new business can generate jobs for unemployed residents while earning some profit for his family's future. Like other successful retail executives, Joe does not focus on profits alone. He knows that doing so will not earn him repeat businesses. Yes, this truck wash business owner goes for long-term relationships. That’s why he exerts extra effort to satisfy each of his customers. Do you want a clean truck? Well, to Joe, a truck is not clean enough if it isn’t sparklingly shiny, squeaking clean, safe and fresh-smelling. And he does it faster than any traditional truck wash ever can. It’s because DetailXPerts has mastered a unique steam cleaning methodology that cuts through dirt and grime efficiently, thus reducing the cleaning time to half. And since it uses nothing but water and organic cleaning materials, no toxic chemical residues will linger in your vehicle, making it safe for you and your passengers. Who else, but a vehicle lover, can clean and detail better? 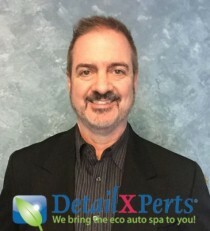 Joe knows that dust, dirt, and grime that have settled deep into nooks and crannies of a vehicle's interior attract bacteria that consequently affect its appearance and odor; and improperly cleaned and dried vehicle parts can lead to premature rusting. Yes, Joe has undergone extensive training at the company’s headquarters, but he wants to learn more. He is aware that he is in an entirely different league. That’s why he takes pains to learn everything he can about his truck wash business. He seeks the advice of the franchisor and fellow franchisees if and when necessary. He actually enjoys the training, support and periodic visitations from his DetailXPerts family. To you, this means that your vehicle will be serviced according to the famous DetailXPerts standard all the time. Meet Joe Gonzalez: the truck wash business owner who values the environment, loves people and vehicles and has that unending desire to learn how to serve you better. Do yourself, your vehicle and the environment a favor. Schedule an appointment today.